The Dubai-owned airline Emirates has announced a 60m-euro (£52m, $82m) sponsorship deal with AC Milan. The four-year deal, due to begin in July, will see Emirates become Serie A team AC Milan's shirt sponsor in place of the Austrian betting company BWin. Emirates already sponsors several football teams including Paris Saint Germain, Hamburg and Arsenal. 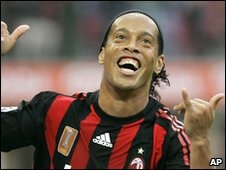 The airline has a pre-existing sponsorship deal with AC Milan that does not include shirt sponsorship. Speaking to reporters on Friday, AC Milan's vice president Adriano Galliani said the £52m deal could eventually be worth even more to the club if results on the field go its way. Milan also has a sponsorship deal with German sports kit maker Adidas until June 2017. The deal is the latest investment in football by the airline, which is state-owned. Its sponsorship agreement with Arsenal in 2004 was the biggest in English football history - worth in excess of £100m to the London club.